used 29,000 miles on 48' steel cruising cutter "Sapphire"
As you know I am the owner and builder of the 48' steel cruising cutter "Sapphire". In 2002 1 was faced with a voyage from Charleston South Carolina to the U.S. territory of Guam, 12,000 miles away on the other side of the world. My budget did not permit the installation of both an electric autopilot and a windvane, so I decided on a windvane as more rugged. Sapphire has an open "swim platform" or "sugar scoop" transom, so I needed a windvane which could be readily adapted to the geometry, Sailomat was the best choice for a clean stylish installation which would not turn my stern into a "junkyard" of welded pipes in all directions. Additionally, Sailomat is easily removeable when not in "cruising mode" in order to use the swim platform for scuba operations and so on. During the voyage with crew from Charleston to Panama I became fully familiar with the operation of my Sailomat windvane. My next legs were 4,800 miles solo sailing to Hawaii, and then 3,600 miles solo to Guam, so it was imperative that I had total faith in the windvane under all conditions. I had to reef and unreef by myself sometimes several times a day, and my Sailomat allowed me to sail along under jib alone while I handled my 650 square foot main under all conditions. I was also able to change my roller-fuling genoas by myself, which is a brutal job under sail. These factors meant everything to me in terms of being able to make the voyage alone. Over the rest of the voyage to Hawaii and to Guam and in 1999 back to San Diego I have sailed Sapphire about 17,000 miles, all of it on the Sailomat when under sail. I have experienced sailing conditions from 5 knots true wind to 45 knots true wind and 15 foot waves and the windvane has handled it all, including twice sailing under storm trisail alone. Supposedly you cannot sail dead-down wind in very light air with a windvane, but with my Sailomat I have done it again and again. Even when the sails are not perfectly "balanced" (in order to get up maximum sail area for the available wind) the Sailomat can compensate and keep the boat on a steady course. In summary, I consider the Sailomat to be the most important piece of gear on the boat for voyaging after the mast itself It is a piece of gear which I would not go offshore without, and I cannot recommend it highly enough. "..We headed out of the Saipan harbor with 20 to 25 knots gusts to 30 and seas 6 to 8 feet. I set course for a beam reach, trimmed sails and lowered the SAILOMAT (601) into the water,... set the windvane to the apparent wind..
WOW, the SAILOMAT locked on and we all sat and watched this bad boy hold course at ease, and the comments from the fellow skippers that we never saw such smooth and slick performance from any self steering vane, period. I was commented on my installation of the control lines but the SAILOMAT took the honors. My sail trim was to say at least not good but the windvane could have cared less.... I set a close haul.. and again it held a heading better than anybody on board could have.... As you can see I am very satisfied with the SAILOMAT and all my crew agreed that the simple installation and high tech puts the SAILOMAT the number one in Saipan. I leave March 1 for the Philippines and will be sailing solo but with the SAILOMAT I am really looking forward to the trip... Thank you for all the support..
"The single-handed race called Race For Life which I participated in last June 21st was an exciting experience. It was probably the longest match race in history as it went from San Diego to Honolulu, Hawaii.. My competitor and I both used identical Kelley Peterson 46 sloops with cutter rigs. And we both used your mechanical self steering wind vane system called the SAILOMAT. The SAILOMAT system that you developed is an excellent system and I could not have enjoyed the trip without it. I encountered all conditions... 25 knots of close reaching, under 5 knots of beating, and 35 knots with spinnaker or #1 genoa wing and wing. The seas got quite high at times but the SAILOMAT adjusted well to all the conditions. I was particularly impressed with the mechanics of the servo system and the durability of your equipment. With very little daily maintenance, I was able to use the SAILOMAT from start to finish of the 2300 mile trek. As you know my boat weighed over 33.000 lbs. and was over 46 feet long. The SAILOMAT provided me with a sense of security and allowed me to do all the other jobs needed while doing a single-handed race.."
Also executive director of the Sail America Foundation & consultant to San Diego Yacht Club's America's Cup Task Force. "..We just recently returned from our single-handed race to Hawaii in the Kelley-Peterson 46's. Your SAILOMAT self-steering windvane functioned flawlessly during the trip. We were able to steer the boat in 25-30 knots of wind and 8-10 foot seas downwind without fearing that the boat would jibe. I realized how much confidence I had in the SAILOMAT's ability to steer my boat when I could comfortably go down in the middle of the night with the wind blowing 30 knots and with large following seas and catch an hour of sleep. Confidence in the SAILOMAT allowed me to get much needed rest during the strenuous trip... It goes without saying that we literally could not have successfully completed this race it had not been for the SAILOMAT self-steering system.."
"The first chance we had to test the SAILOMAT was on our trip north between Martinique and Dominica. The big Atlantic swells were coming in from the east meeting an unusual south-westerly chop and a variable wind from the west. The motion was so unsteady that my wife and I were having trouble holding on and our Autohelm 5000 Linear Drive (autopilot) was struggling to maintain our course. I decided to test the SAILOMAT thinking that these were the most unfair conditions for a windvane.. However, we were amazed when the SAILOMAT went to work and performed better than our electronic autopilot and much better than a tired or bored helmsman...we were wondering why we waited so long to purchase a windvane.. 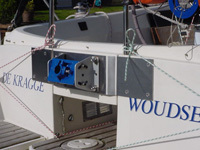 I am now writing to thank you for designing a superior product.."
"Since installing the gear, we have cruised the boat several thousand miles, including a mainly two-handed trip from the UK to Sweden, Denmark and Germany during which time we met substantial amount of heavy weather. The SAILOMAT steered very successfully on all points of sailing.."
"Had a great sail down (Canada to Cabo San Lucas, Mexico). The best part was a storm of 1 1/2 day of 50 knots and over, which followed a 3 day gale. Elapsed time from False Creek was 18 days, 10 hours. The windvane steering was the best bit of equipment on the boat!.." "It is hard to believe there exists any electric autopilot that would beat the SAILOMAT in strength, endurance and reliability. You know for sure that it (SAILOMAT) works, just not hoping as for the electric autopilot. Should the electronic parts or power supply fail, you are stranded. 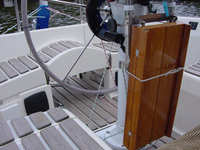 A control line to the tiller (from the SAILOMAT) may become damaged, but you can actually observe it and repair it before it becomes critical..
During months of sailing in Mediterranean, Atlantic and Baltic, the SAILOMAT has not failed a single time, not shown any wear nor the slightest sign of corrosion. Fantastic! The Sailomat is so sensitive that it will steer the yacht even if you hardly detect any wind. The Sailomat also steers in a gale. Reduce sails, balance the boat, hook up the SAILOMAT, and relax! Thank you SAILOMAT. The SAILOMAT does the same job as several crew members, working 24 hours. Only check the wind shifts. Without the self-steering windvane, such long sailing voyages would be absolutely impossible for me. 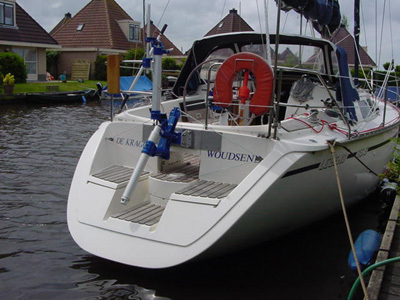 "Once more- I am so pleased with my SAILOMAT- I can't believe how well it performed in light air.. Since I had never used a wind vane before I expected to have some difficulty initially but actually did not.. I find it so easy to use that I use it even where I frequently tack, such as Pugent Sound or the Strait of Georgia.."
"I have sailed over 40.000 miles with my SAILOMAT and never had a problem.."
"My SAILOMAT is brilliant. It steers better to weather than I do..."
"The SAILOMAT design is innovative and may have a profound influence on the future of self steering.."
"The SAILOMAT is setting a completely new standard of performance for self-steering devices, unmatched by any other gear presently on the market..."
"Performance under sail is absolutely faultless.. The SAILOMAT is one of the most advanced gears available.."
"In the 1970's the SAILOMAT gear was regarded as the Rolls Royce of windvane gears. 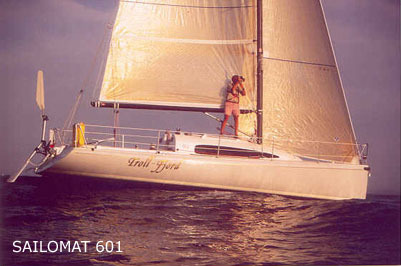 A few years ago, the old SAILOMAT 3040 was replaced by the much simpler and cheaper 536 model, which manages to combine sophistication of design with beautiful simplicity.."
" One rarely comes across a product which has been substantially improved and yet costs much less than previous mark. The new SAILOMAT are vane steering gears which represent major improvements. The new design is much cheaper than the earlier model..
..Dr Stellan Knöös has improved the equipment enormously.."
"SAILOMAT, many thanks for fantastic equipment and help..
Special thanks to SAILOMAT (of Sweden) for an excellent self-steering gear..
-in recognition of extrordinary achievements. First woman to sail single-handed round the globe via Cape Horn - and in the fastest time ever (1978). "Since I had navigated before with the older Sailomat model, naturally I had equipped my yacht with the last SAILOMAT model, and I am absolutely excited about the precision of its operation. I have broken nothing in three years of use..
and the best performing steerer.."
"Here's one of my most vivid memories from our recent cruise across the Atlantic and into the Mediterranean. I was on deck watch, alone in the middle of the third night of our trip. A brilliant moon illuminated the ocean. And there, stretched out behind our boat in the moonlight as far as I could see, was our wake. I was absolutely thrilled. Mostly because I wasn't steering. The wind vane was steering. There was no noise. We weren't using any power. There was only the occasional swing of the vane and the subsequent turn of the wheel. It seemed so natural. And that was the first time I came to truly appreciate the value of a wind vane. What a pleasure that night watch turned out to be for me. I'll never forget it! Admittedly I wasn't much of a wind vane believer prior to this trip. I had my 48-foot aluminum cutter fitted out with a powerful electric autopilot..
We started our trip under autopilot, and I really don't know when we would have hooked up our SAILOMAT wind vane if something hadn't forced me into it..It didn't take long. On the third day ..a line wrapped around our propeller, and without ability to charge batteries, we couldn't be using the autopilot. The wind vane SAILOMAT came heroically to our rescue.. Before long the watchstanders were having a great time with their new 'natural' helmsman. I called the device Stella, a name derived from SAILOMAT designer Stellan Knöös. I can still hear myself yelling at the top of my lungs one afternoon , "Stella you are magnificent," as the vane sent us straight east across the Atlantic en route to our first stop in the Azores.."
"I just got off the phone with Mr. Newson Campos, owner of the 36' sloop 'ANA-C'. He arrived in Santa Moura, Portugal coming from Venezuela, and said your self-steering vane was the best 'crew' on the boat. At one point they sailed with 50+ knots of wind during five days and had no problem whatsoever. He was impressed with the Sailomat. Copyright © 2019 Sailomat. All Rights Reserved.